The East India Company sent me a jar of their Rhubarb & Ginger Extra Jam to try. My first thought was to make jammie biscuits. What could be better than a jammie dodger, all buttery and jammie? 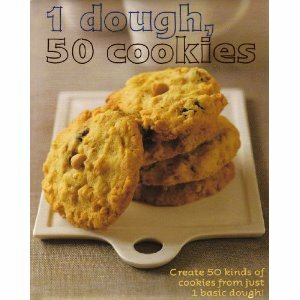 I had a browse online and through a few cookbooks and came up with this recipe from a wee book called 1 dough, 50 cookies. A nice little book with a lovely selection of cookies and biscuits in it. This is the first time I have tried anything from it. As per usual, I have changed the recipe into cup measures. Anyway, back to the jam. I really love rhubarb. In fact, we enjoyed some rhubarb crumble last night after a bowl of Carrot & Coriander Soup. I decided to go ahead and use it in the biscuits. I filled some with strawberry jam, some with Rhubarb & Ginger Extra Jam and a few with nutella. The biscuits turned out rather well, although some were a little more golden than others. (I think I will have to turn them while they cook next time and just practise with a few more batches, until I get a feel for when they are ready.) The biscuits where lovely and buttery and all the fillings were well received. Preheat the oven to 190c/375g/gas mark 5. Beat together the butter and sugar, then add the egg yolk and vanilla and beat until well combined. Sieve in the flour and salt and fold into the mixture. Bring together into a dough. You may think it will never come together, but just keep lightly kneading it and it will come right. Cut the ball in half, cover both portions in clingfilm and pop in the fridge for a few minutes. Not for too long or it will be more difficult to work with. Roll out each ball between two layers of cling film until it is a few millimetres thick. Use a 7cm cookie cutter to cut as many circles as you can, re-rolling as you go. I managed to get 16 biscuits out of the mix. Place the first batch of cookies on a baking tray lined with greaseproof paper. Pop them in the oven for 8-10 minutes. Just keep an eye on them and turn the tray as you go, so they bake evenly. You don't want them to be too golden. Place this batch of cookies on a lined baking tray. Take the first batch out of the oven and leave to cool. Pop the next batch in the oven, turning the same as the first batch. Take them out a few minutes before they are ready and brush them lightly with egg white and sprinkle them with sugar. Pop them back in the oven for the rest of the baking time. Once all the biscuits are cool. 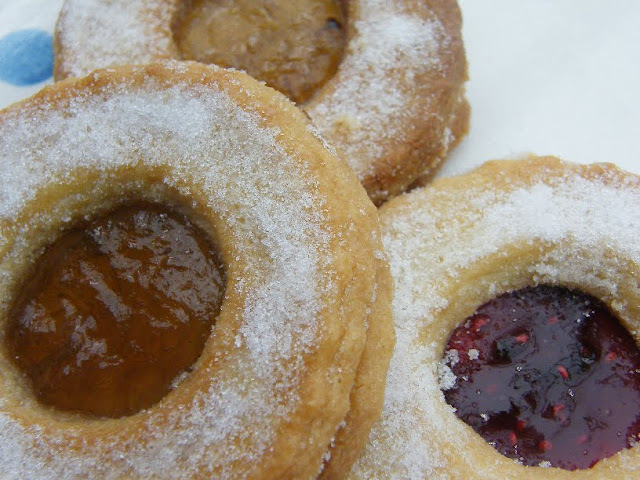 Spread a layer of jam on each full biscuit and top with a sugary biscuit ring. They look fab and what a treat to be sent some yummy jam to try. I have a recipe for rhubarb and ginger jam I want to try out at the weekend, fingers crossed that one doesn't turn out to gingery!! 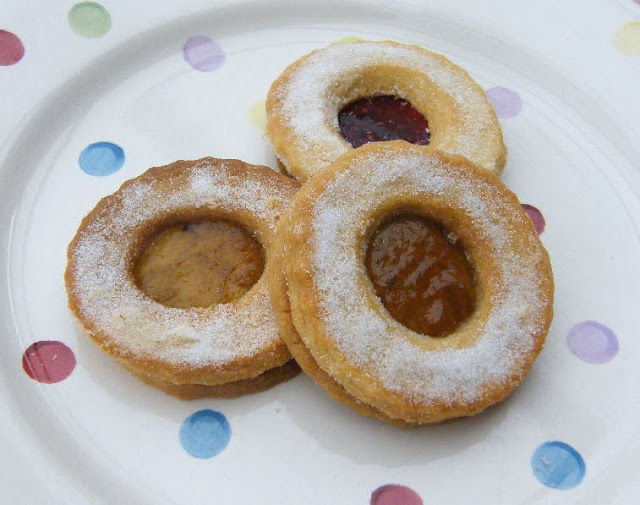 I LOVE jammie dodgers but have never thought to make them myself. What a great idea to make them with different flavour jams (and Nutella!!). Shame about the jam - I absolutey love rhubarb too. Love these biscuits, Jacqueline. AND I love rhubarb! Sorry the ginger was so strong. There's a company in Michigan called American Spoon Foods that makes a marvelous rhubarb jam. So out of season, that's where I go for my fix! Hi Antonia, The jam was lovely, just not quite what I was expecting when I tried it. mmm, sound gorgeous and two of my favourite flavours. Another one of your delicious recipes to tag - I'm not supposed to have sugar but have developed a rather bad biscuit (and toast, mmmm jam topped) habit of late! 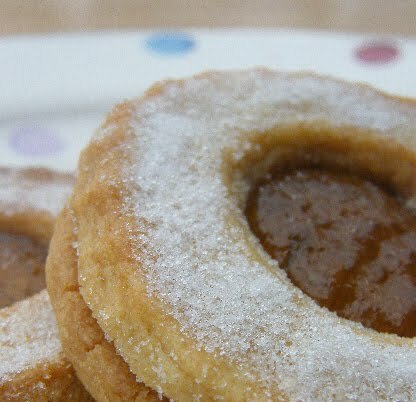 One of my favourite cookies is a jam biscuit from Peak Freans. These remind me of them Jaqueline. I'd love that jam - the more gingery the better for me. The strawberry ones look particularly beautiful. Oooh... these look LOVELY! I can only imagine how yummy the ginger is with these! Mmmm, I love jammie dodgers. Weirdly I have some rhubarb in the freezer that I was meaning to make into jam too. I guess its got to be rhubarb and ginger jame then :-) I'll have to definitely try out the biscuits though, yum yum! They look very sweet - in both meanings of the word! Great recipe! Let me know how your jam turns out Michelle, I would be interested to find out the quantities you use and how the flavours balance. Oh my! I wish I had one right now. Such a creative cookie / biscuit. Jammie dodgers must surely vie with custard creams as the best biscuits! Yours look great and I love the sound of rhubarb and ginger jam. I have a product from these very same people, I haven't done anything with it yet though. I love the word "dodgeresque"! I suppose they're similar to Linzer biscuits really?